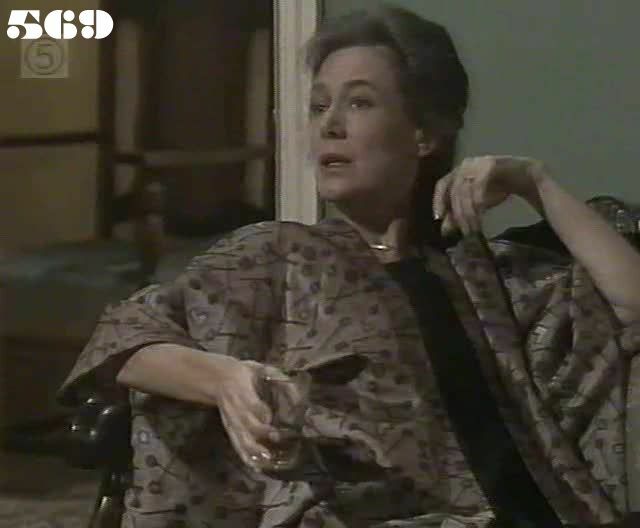 The number of women has now gone down to 47, according to Ann's count of the number to be fed, but goes back up to 50 later in the episode with three (unseen) new arrivals. Under Pippa's influence, Ann is turning a little Japanese . Classy invite from the print shop : note the scare quotes round "all welcome", impying that maybe they aren't. Nora talks her way out of the situation, by telling Nikki to play "Growing Up" with someone else, then simply walking away from her. Lisa gets heavied by Lou again who threatens to print the front page on her face, but she gets no support from Joanna. The women find Lisa in tears in a corridor and she asks Meg to take her to the Goverment to get permission to leave the programme. Ann agrees to let her leave and says she will intervene on her behalf so she doesn't have to go to a juvenile institution. Joanna offers to bring goods in for Lou instead of Lisa, but demands payment from Lou. Lexie distributes the latest version of the "Free Press" and reads Willie's reply to a prolem from "Rita" who is worried her husband is cheating on her while she's inside. Jenny returns to Wentworth: a retrial has been ordered after the jury failed to reach a verdict. Joanna shows Nikki the money she's got from Lou, but has to hand it over when Nikki sticks the knife under her nose. Joyce is given the responsibility of distributing the supplies of vitamin supplements to the women: one tablet each at breakfast... May and Nora hint to Cindy about Joan's black gloves and Willie adds an anecdote about a girl (completely made up) called "Bubbles" who was driven mad by it and poured acid over her own face. Despite the story's lack of plausibility, Cindy runs out of the dining room. Meg organises staff to bring food in: Officer ("Wendy") Ward declines to bring potatoes in her car boot as her husband left fishing bait in it and it still stinks. As they are collected by police car to go home, Nikki tells Joanna she has to meet her on the outside later that night. Nora insists that they must try to get the knife away from Nikki, even though she suspects Nikki is not as tough as she pretends. Pippa goes out for a meal with Ben and she tries to persuade him to take up Daphne's case again. Nikki and Joanne rob a chemist's shop. Joanna trips and twists her ankle, and Nikki leaves her behind to be caught by the police. Lou lies to Lexie and says he hasn't been able to get the girls to get stuff in for her. Nikki puts on a tearful act to manipulate her mother into giving her an alibi. Daphne worries that she is suffering from malnutrition. Cindy and Nikki are the only ones to turn up for the second day of the rehabilitation programme. After a discussion with the picketers, Frank Bolton makes the officers stop bringing food into the prison. Lou tries to get money from Lexie so she can buy the pills from Nikki. Meg and Ann are the only ones not bound by the Union's decision, so they have to bring the food in. Lexie bashes Cindy when she catches her in her cell helping herself to some of Willie's biscuits. Lou tries to get the pills from Nikki without paying for them, but gets her hand slashed . Nora leads a protest in the dining room against the poor standard of the food. Bolton uses the blockade to put pressure on the Department to agree to a pay rise for the officers. Ann is delighted when Julie tells her she has found some more duplicate invoices. Joan tries to discipline Nikki when she finds her alone in the rec room, but Nikki reveals that she knows all about Joan and Terri.